Located in the illustrious Uptown neighborhood, an assortment of exceptional shops, restaurants and attractions surround One City Block. With a Walk Score of 85, these studio, one and two bedroom apartments place you near Interstate 25 and East Colfax Avenue. One City Block residents enjoy Zagat-rated food and drinks within close proximity of the community. Steuben’s Restaurant, voted Denver’s Best Bar Food and featured on Food Network’s Diners, Dine-Ins and Drives, serves home-style favorites with a Southern flare. As the Best Outdoor Mexican Spot, La Loma concocts authentic dishes and drinks that appeal to every pallet. Denver Pavilions, 16th Street Mall and Cherry Creek Shopping Center, prime shopping destinations in the area, feature the latest styles from a multitude of retail shops, department stores and boutiques. Along with close proximity to the 16th Street shuttle and the Union Station Light Rail, One City Block residents are also near the Denver Art Museum, the Denver Zoo, the Pepsi Center and the Downtown Aquarium. 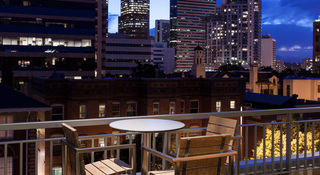 Explore the wide variety of shops, restaurants and entertainment near downtown Denver when you lease a studio, one or two bedroom apartment from One City Block.